Want to put Italian chicken and pasta on the menu tonight? 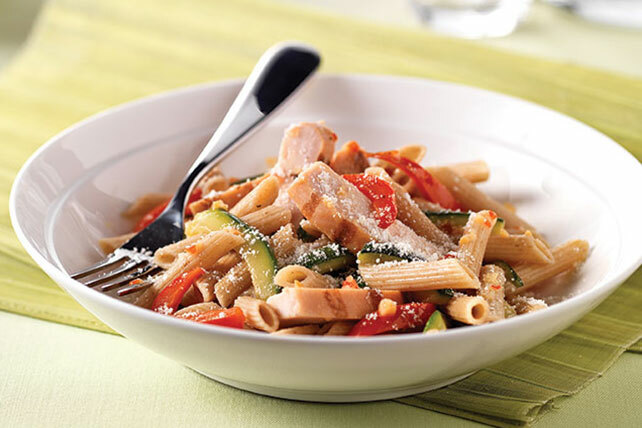 Turn to this 30-minute Healthy Living recipe for Zesty Italian Chicken Pasta with Vegetables. Meanwhile, heat oil in large nonstick skillet on medium-high heat. Add vegetables; cook and stir 5 min. or until crisp-tender. Add chicken; cook on medium heat 3 min. or until heated through, stirring occasionally. Drain pasta; place in large bowl. Add chicken mixture and dressing; mix lightly. Top with cheese. Refrigerate any leftovers. Enjoy the next day as a cold pasta salad. Prepare using KRAFT Light Golden Caesar Dressing.